How to watch an eclipse. Happy eclipse, everybody! The celestial event has come and gone, and I managed to waste a perfectly good afternoon that I could have spent writing. At least, I slacked off in style. Note to all concerned: the cooler in the photo contains the Coke and ice; I am NOT drinking straight rum. Also, you’ll notice the evidence of a just-mowed lawn all over my driveway…a testament that I wasn’t a complete slacker. For what it’s worth, I more than made up for it today, hitting the 65,000-word mark on my latest novel. Not that that’s an important milestone or anything, but it happened, so I thought I’d mention it. I’ll get around to talking about the book one of these days, but I think I may be slightly afraid that talking about it will make it not happen, somehow. Not that I’m a superstitious person or anything, but everyone’s allowed to be a little incongruous, now and again. 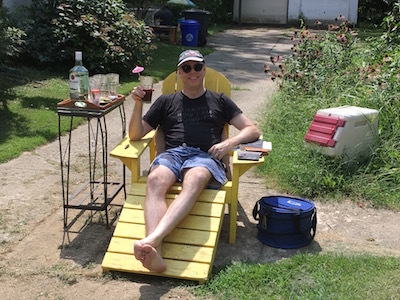 Hard to tell from the photo, but I’m armed with a homemade pinhole projector for safe eclipse-viewing, and also a book to pass the time and the Cuba Libres. At the moment, I’m halfway through The Bear and the Nightingale, by Katherine Arden, which I still have mixed feelings about. I really am a little beat from a serious writing session today, but I want to give a quick shout-out to my fellow Liar’s Club member, Kelly Simmons. Her new novel, The Fifth of July, launches tomorrow, and you can meet the author at my favorite bookstore, Main Point Books. The shindig starts at 6:30, tomorrow (Wednesday). I imagine a reading might be involved, followed by fisticuffs and ugly comments about historical events that never actually occurred. Come join the fun! I would also be remiss if I didn’t mention that the 2017 Barrymore Award nominations were released yesterday. I’ll refrain from commenting too much, since I didn’t see a lot of theater last year, but I’m happy to see that EgoPo Theater’s The Seagull got a bunch of nominations. If you missed it, I had a lot to say about the production here. Hope all is going well for my gentle readers, and hopefully, I’ll come up for air more often to give you guys more current updates about my latest endeavor. It’s a hoot!